Wholesale, with its basic feature of selling goods in large quantity, requires a specific sales policy. For Magento store owners targeting for large-scale buyers, the default Magento 2 may not provide enough good functions to support them. Hence, we list out these 7 best extensions which will be a big help for Magento 2 wholesalers to boost your business and gain customer satisfaction. 1. Wholesale fast order – Bulk order form. The extension is an ideal choice for Magento store owners to limit customers abandonment from your page due to complicated purchasing process by reducing the time for searching and selecting goods. 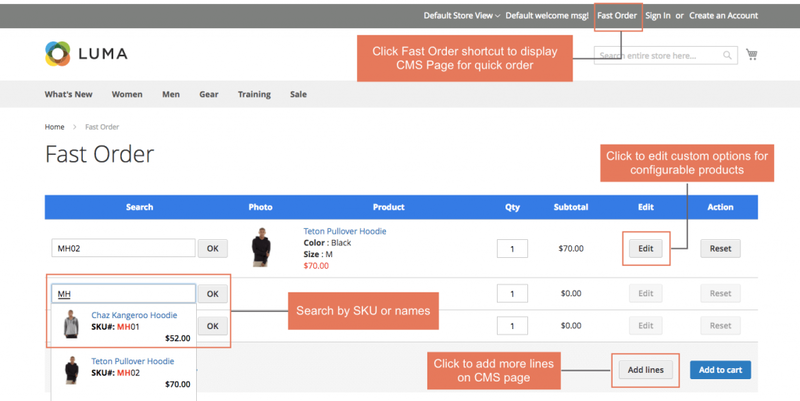 A new CMS Page named “Fast Order” will be added to your Magento store. A search box with autocompleting keywords when typing some letters is available to make a better product searching process. Once finding the item, wholesale buyers can fill in the desired number in a quantity box. At the same time, a popup also supports choosing product options without leaving the CMS page. Moreover, it’s even better with the CSV import function for simple products without custom options. Bulk ordering is now easier than ever. This is another excellent module for mass selection from product list pages like search result page and category page. On top of that, it is featured with the popup function of Ajax Add to Cart, so you are having the features of two extensions customized in one. 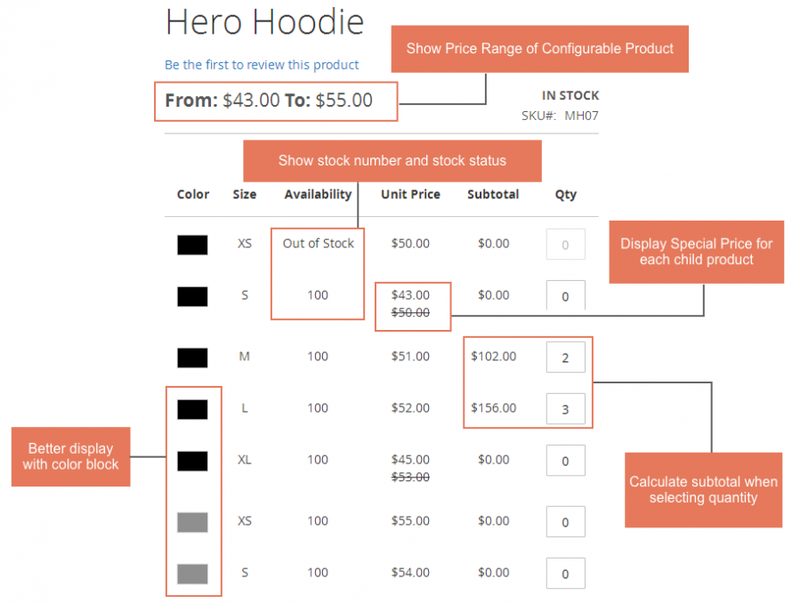 The extension provides a checkbox and a quantity box next to each product in product list pages. 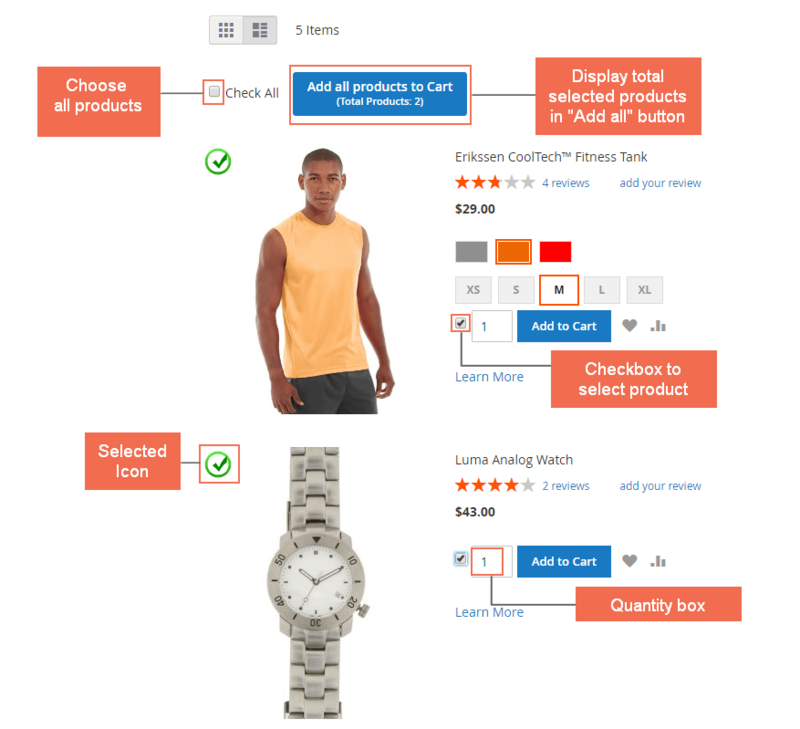 Customers can tick on many items at one time, choose their desired quantity, and a click on “Add all to Cart” button is the last step to make everything go to Cart simultaneously. The popup feature includes two kinds of a popup. The Ajax popup works well with both single-adding and multiple-adding for product options selection. And the success popup will be loved by customers for reviewing items which were added to Cart. If your Magento 2 store is focusing on wholesaling of configurable products, then this is all you need. It enhances both the display and order process for various children products. First, the extension helps to show all children products of a configurable product in a neat table. Each one goes together with its availability and unit price. 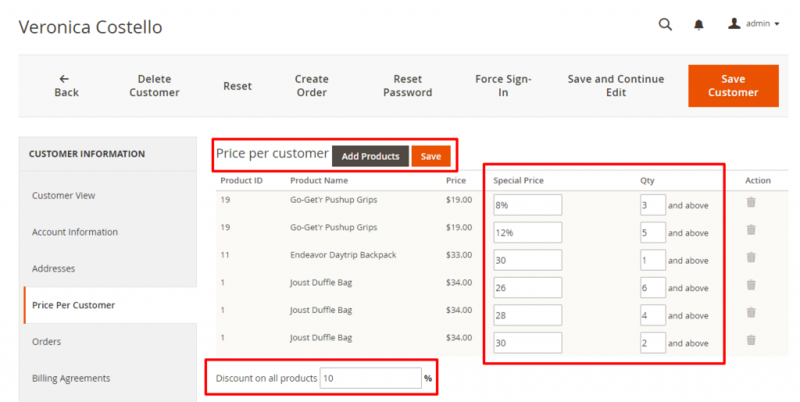 Moreover, quantity box supports adding multiple children products to cart at the same time. The details of quantity and total will be auto-updated right next to the “Add to Cart” button. For wholesale buyers, this is indeed the best way to purchase configurable products conveniently. 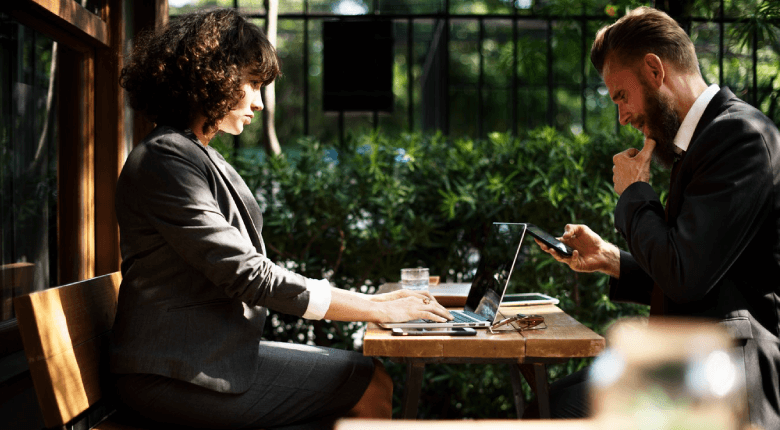 If you are seeking a way to set up a special offer for each wholesaler based on your partnership with them, this extension allows you to do that easily. The module allows you to set different prices for the same product for each customer. With this feature you can set a fixed price, promotional price, and also offer an additional discount on top of the special reduced price. For buyers with a large-scale order, setting up an attractive price policy will surely encourage them to buy even more. Also, you can easily customize your price offer for each customer at the Magento backend from customer configuration. For wholesale and B2B business, negotiating prices and terms with your customers plays an important part in closing the deals. The extension will help you to communicate well with buyers in the process of making a quotation. 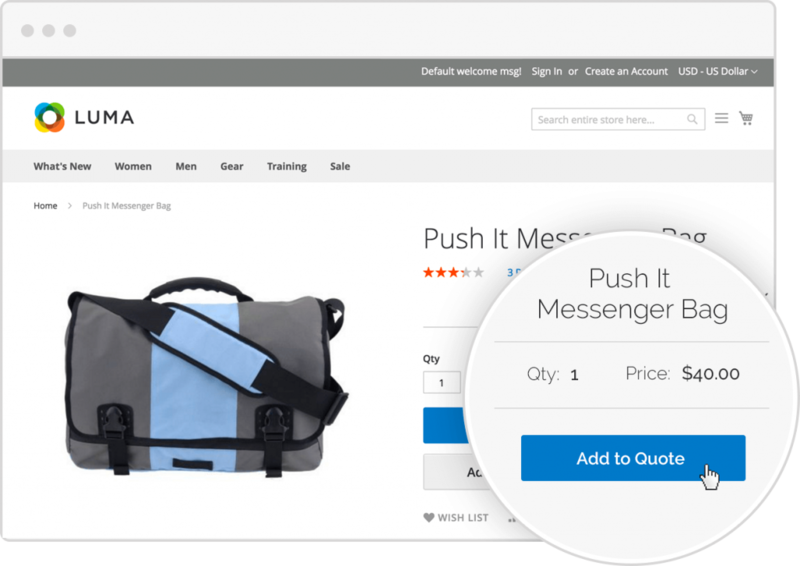 The assigned customer groups will be shown the “Add to Quote” button instead of the normal “Add to Cart.” You can start the quotation process from your Magento backend. When customers call in and request a quote, you can create a new quote and send a PDF proposal in mere seconds. The module will calculate a standard price based on your Magento tier prices, shopping cart price rules or customer group prices. With this option switched on, the quotation procedure is now 100% automatic. Moreover, admins are allowed to assign the sales rep to the customer to keep up a good relationship with them. The act of assigning different shipping and payment method to specific customer group can create a better strategy aiming to prioritize potential and superior customer group. It is sensible to state that the wholesale group should be given priority during checkout process than the general or not-logged-in group. 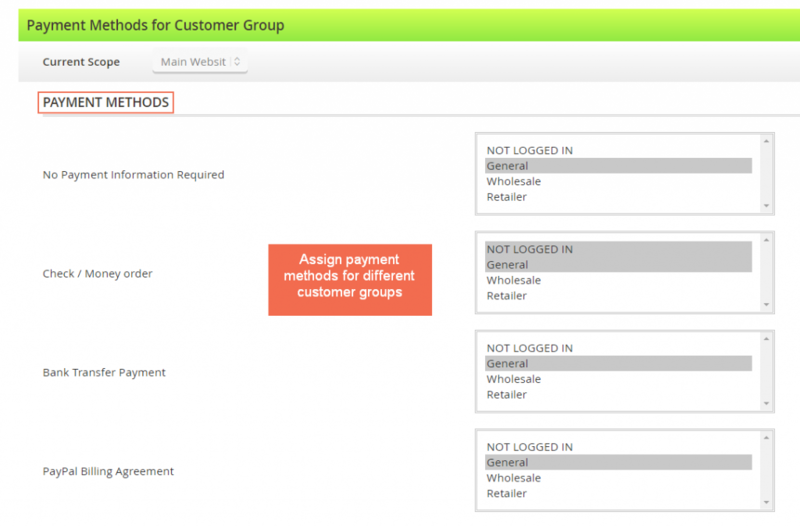 Admin can freely select one or multiple customer groups for each payment and shipping method which is listed at the Magento backend. Instead of a being confused by a long list of shipping and payment methods to choose, buyers now can speed up the process of checkout. Moreover, you can choose a preferable shipping and payment method which can secure the transaction as well as save cost. This is a must-have extension for Magento store targeting for both wholesale and retail. It allows business owners to hide some products from certain customer groups and show them to the other ones. Hence, you can freely set up limited items only for wholesale buyers. You can adjust for certain products or categories to be available only for specific customer groups. The module helps you manage private sales quickly and efficiently. Admins can easily hide pricing for certain Magento 2 customer groups or replace it with a custom CMS-block. At the same time, it is possible to set the ‘Call for price’ block instead of ‘Add to cart’ button or redirect users from hidden pages to 404 page or CMS-pages. With the above extensions to support bulk order from the selection step to the checkout process, we hope Magento store owners can boost sales and also spread their business in the wholesale section. In the future, we will continue our blogging for more Magento tips and recommendation so don’t forget to visit us often or subscribe to our newsletter. If you help any question regarding Magento or merely want to suggest a new topic, we are happy to have your thoughts in the comment section.